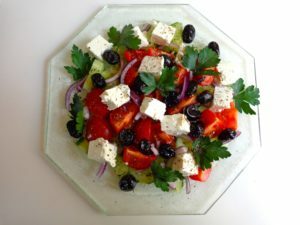 This French version of Greek salad uses fresh herbs instead of oregano and omits sweet peppers. Often paired with a crisp rosé, it makes a refreshing start to a meal or a delightful hot-weather lunch. Preparing the salad takes just five to ten minutes, and the ingredients may be varied according to fancy. For example, I used cocktail tomatoes in the salad shown above, but you can instead use cherry tomatoes (smaller) or big red tomatoes in season. Cucumbers can be astoundingly long in France — up to 16 inches (40 cm). So only half a French cuke is needed for this recipe, while you can use a whole one of a shorter variety. Which olives to choose? The French usually use small, puckered black olives called ‘à la grecque’. But these ‘Greek style’ black olives bear no relation to more familiar varieties from Greece like kalamata, which may be substituted. To flavor the French olives, I place them in a small bowl with half a clove of garlic and a pinch of thyme, fresh or dried, add a teaspoon of olive oil to ‘relax’ them and let them marinate for an hour or so. Moving on to the herbs and dressing, I generally use flat-leaf parsley or mint, but other possibilities include basil, dill or arugula (roquette). Needless to say, the quality of the olive oil you use will be key to the taste of your salad. This recipe calls for a vinaigrette using red wine vinegar, but you could also use balsamic, or even lemon juice. After this long introduction, you may think that this salad is rather complex. Au contraire — it’s totally easy. The quantities below will serve 3-4 as a starter or 2 as a main dish. Rinse the tomatoes and cut into bite-size pieces. Peel the cucumber, or not, as you prefer. Cut into bite-size pieces. Peel the red onion and slice thinly. Arrange these ingredients on a serving platter or individual plates. Cube the feta and scatter over the other ingredients. Add the olives. Add a little salt — not much, as the olives and feta are already salty — and grind on some black pepper. Remove the leaves from the herb sprigs and scatter them over the salad, snipped or not. In a small bowl, swirl together the oil and vinegar. Drizzle over the salad and serve, with some crusty bread and a bottle of red or rosé alongside. Serves 2 as a main dish, 3-4 as a starter. Note: This salad may be prepared ahead of time. Refrigerate after adding the olives, and add the seasonings, herbs and vinaigrette just before serving.